Filled with serenity and peace, Suzie Wong is an exceptionally elegant environment to go on a date with your loved ones or the girl or guy of that you have been longing to ask them out. The environment is influenced by Hong Kong style layout, fully furnished by ancient ornaments and decorations with a little dose of English decor. Suitable for wine and cocktail lovers, Suzie Wong is a great place for dates or just casual chats with buddies. Diners could also enjoy Asian delicacies while enjoying jazz performances by live bands or DJs. 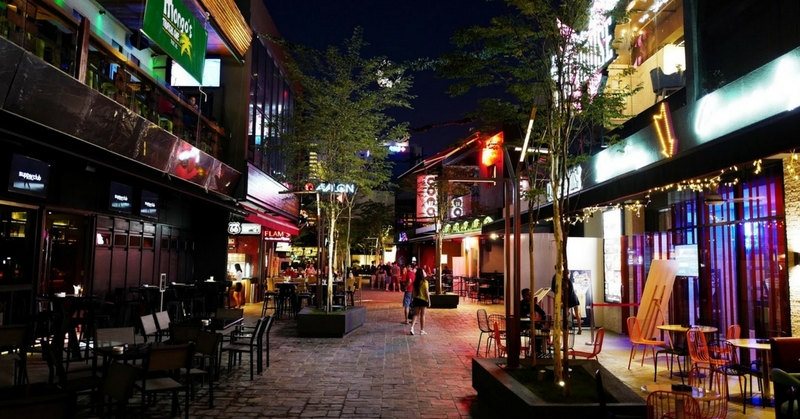 Located right just beside Zouk KL along Jalan Tun Razak, it features a street of entertainment filled with cocktail bars and lounges with vibrant live performances waiting in line to entertain us on a great night out with jazz music and electro beats. With limitless selection of cocktails and old school pints of beers such as Artebar, Mango’s Tropical Cafe, Ikki, Vibes Club, Avalon and lastly, Wine Connection, where wine lovers could drop by for elegance of wine tasting, as TREC is undeniably one of the best places to have pleasant nights of memorable time with friends and peers alike. If you are looking for an evening of fine and luxurious dining with exquisite wine, then 33 Blue Room would be the perfect place to do that. Serving a wide range of western cuisine, from customers’ favourite deep fried pork belly and signature ribs, to sweet desserts as their mouth-watering dark chocolate cake is a must-try for chocolate fanatics. Relaxation will surely be a great satisfaction as sipping wines originated from different corners of the world in a cozy, dim environment is the best chill out ever. Fancy drinking on a helipad bar while enjoying a panoramic view? Say no more as Stratosphere at First Avenue is the perfect platform for you ladies and gents to enjoy an outdoor dining and marvellous scenery of the city of Petaling Jaya with stars glazing down upon you while sipping your precious cocktail drinks. Drinking by the lake feels nothing but serenity in your mind. Located at Setiawalk, Puchong, Sector 7 offers night owls to chill with peers and pals by the lake with live bands performing as well. With great promotions of bucket of beers, call up your drinking buddies to enjoy a peaceful and quiet drinking session on a Friday night.